Sitting in Southern California there isn’t the same sense of seasons. As I sit and quietly contemplate, though I can feel the earth transitioning and all of of nature starting to wake. Imbolc is right around the corner. In modern american culture this holiday has been transitioned into the practice of spring cleaning. This is the time to clear out the old in preparation for new growth. 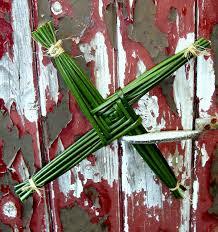 Imbolc, Brighid’s Day, St. Brigid’s Day, Mid-winter Festival of Lights, spring cleaning. The fading of winter goes by many names. No matter what name you use, now is the time to sweep out all of the detritus in our lives and to prepare for the year to come, laying the groundwork for our next step. As January comes to an end it is the perfect time to really contemplate on the things, people and energies in our lives. As a natural course, much like a snake, we have to shed the old to allow us to continue growing. That skin, which protected and carried us forward, must now be shed so that it doesn’t hold us back. What have you outgrown that you need to let go of? What in your life no longer serves your purpose? Are there things in your life that are holding you back?